Otis Elite, Wingshooter and Tactical Pink Cleaning Systems. Illustration courtesy of Otis Technology. Over the years we have accumulated more gun cleaning kits that we can count. Some we bought, others were gifts and a few were inherited from friends. They all were lacking in one or more areas. The cleaning rods were usually cheap and flimsy, the brushes never seemed to properly fit our bores and the patches? We could have done better by cutting up some diapers. That said, we persisted for years, until we were introduced to the Otis Elite system by Carl, our daughter's husband. He is a hunter and tactical shooter who insists on quality from his guns and ammo to his cleaning kit. Recently, while cleaning my wife's Remington Premier O/U shotgun, I was searching for the right jag brush on my bench when Carl opened up his Otis Elite kit and told me to take my pick. All I could do was stare at this superb kit. If it isn't in the Elite, you really don't need it. Ok, we have everything on our bench that is in the kit, so why buy the Otis Elite? The answer to that question is, when was the last time that you went local hunting trip and took any gun cleaning stuff with you? When is the last time you went on an extended hunt, involving multiple firearms and took your gun cleaning stuff? When was the last time you went camping, took a rifle or pistol for a bit of plinking or varmint hunting and took your gun cleaning stuff. Rarely, if ever. right? We spend thousands of dollars on our firearms and trips. We remember to take our sleeping bags, cooking utensils, changes of clothing, food and ammo, but neglect to include gun cleaning stuff. Why? Because, it is scattered all over our reloading bench and the cleaning fluids are often in bottles that can break or leak. As such, we leave them home. Like the postman, we venture out in rain, sleet and snow. We fall down in the mud, get blood on the actions and the best we can do is find a rag to wipe the gun down. All of the above are recipes for unnecessary wear, tear and damage to our expensive guns. Now, don't get us wrong, over the years, we are just as guilty as everyone else. However, not any more. The Elite bag folds up neatly to be tucked away in the back of your truck, tent or camper. The removable Tactical Case inside the Elite bag is compact and ideal for carrying in your backpack. You can load the tactical case with the tools specific for the firearm you are using on that day and be ready for just about any problem. Six (6) Memory-Flex® Cables of varying length to fit all firearms. Twenty-two (22) bronze bore brushes remove copper deposits and other fouling. They fit rifles from .17 to .50 caliber, all gauges of shotguns and all pistol calibers. Obstruction removal tools for jammed cases and other blockages. Optics cleaning gear for care and maintenance of scopes, rangefinders and binoculars; includes a bottle of Otis lens cleaner and lens brush. Patches, two tubes of Otis Ultra Bore 85 solvent, half a dozen cleaning jags, a Blue Nylon AP brush and an empty chamber indicator. 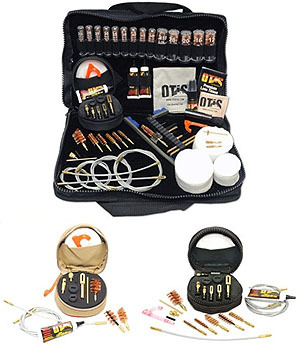 Even with all the above items in the Elite carrying case, there is still ample room to add additional cleaning supplies or tools (extra patches, screwdriver set, more solvent, etc). With an MSRP of $149.99, it isn't cheap. However, compared to the cost of our guns, it is a bargain. With all of the above said, there are some folks who only have a couple of guns or just shoot shotguns. These folks require a tactical case that is especially equipped for their needs. With that in mind, the folks at Otis have an assortment of Tactical Cases tailored specifically to those needs. The two that were of greatest interest to us were the Wingshooter for shotgunners and Tactical Pink designed for women who shoot everything from pistols, rifles, shotguns and muzzleloaders. In fact, if you don't mind the pink to remind you to support the fight against breast cancer, this case is just about perfect for everyone. 8" and 36" Memory-Flex® cables for effective and correct Breech-to-Muzzle® cleaning. Three (3) gauge-specific bronze brushes remove deposits and other fouling for 12, 20 and 28 gauge shotguns. Rubberized patch savers® for complete 360° cleaning of barrel. T-handle and obstruction removal tools for jammed shells and other blockages. Lightweight upland style soft pack with belt loop for convenient carrying. The Wingshooter has an MSRP of $49.99. Contains the brushes needed to clean .22, .270, .30, .38, .45 cal. rifles/pistols and 12/10 ga. shotguns. Patch for cleaning all .17-.50 cal. rifles/pistols, .410 – 12/10 ga. shotguns and all in-line muzzleloaders. 8", 30" and 34" Memory-Flex® cables for effective and correct Breech-to-Muzzle® cleaning. T-handle and obstruction removal tools for jammed cases and other blockages. Lightweight soft pack case with pink accents and belt loop for convenient carrying. The Tactical Pink has an MSRP of $59.99. If you haven't looked into the Otis Cleaning Systems, we recommend that you do so at your earliest opportunity. They have everything one needs to keep our firearms in proper working order and when coupled with one or more of the Otis O12 cleaning solvents, they represent an unbeatable combination. Copyright 2013 by Jim Clary and/or chuckhawks.com. All rights reserved.